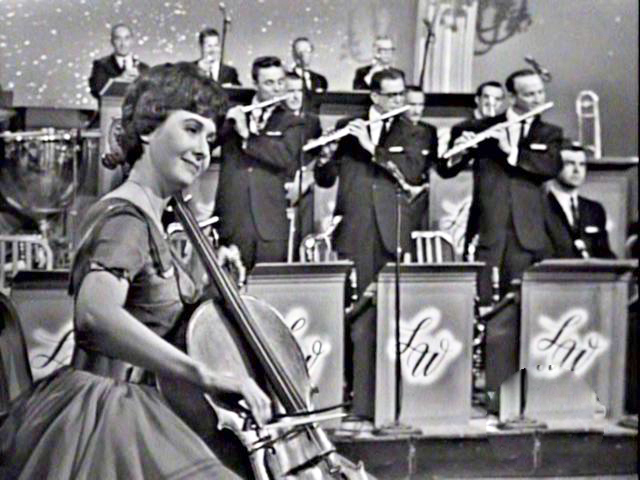 Charlotte Harris played the cello on the Lawrence Welk Show from 1961 to 1978. She also holds the title of being the only female member of the Lawrence Welk Orchestra. Harris was born in Oakpark, Illinois in 1931 and at the age of 5, began playing the piano and cello. Harris turned professional at the age of 12 and began playing at local fairs, compiling an impressive list of 32 medals. After dropping out of high school, Harris took the entrance exam for Northwestern University and was accepted as a freshman student. She later tried to join the Chicago Symphony Orchestra, but the didn't allow women to play at the time. Undeterred by such discrimination, she moved to Brentwood, California in 1956 and worked various venues including in the Film, Around the World In Eighty Days before becoming a permanent member of the Lawrence Welk Orchestra. Harris often appeared alongside Bob Ralston and had a close relationship with Myron Floren. Among After leaving the show in 1978, Harris retired to Palos Verdes, CA where her and her husband, Ed Deveny, teach at the Deveny Music School they founded together.